The most engrossing works in this fine exhibition by Adelaide artist James Cochran are self-portraits in which the face is either not realised in detail or just not seen. 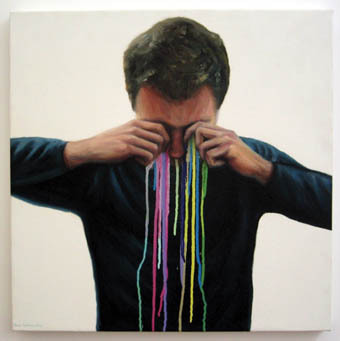 In the most striking, The Artist’s Tears, we see neither eyes nor expression, only the copious tears of paint he weeps (the work has been purchased by the Art Gallery of South Australia). In the smaller portraits the visage is a soft blur of blocks of colour, their arrangement curiously evoking a forceful personality in meditative moments. An accompanying video shows the artist stretched out, staring into a puddle of water on a busy city footpath, studiously ignored by passersby. Other works reflect the artist’s interest in down-and-out street life with a vivid coloration that draws on his years as an aerosol artist and brings an odd warmth to scenarios of despair.